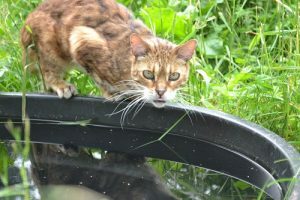 We’re so saddened it was time to say good-bye to Bengal cat Willow. Her chronic health issues became too much for this little girl and it was time to leave her sick body behind. Willow arrived in 2006 with 8 other Bengal cats from Colorado. 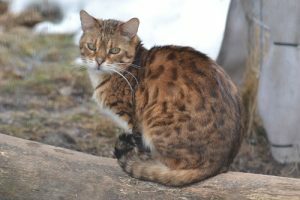 A Bengal breeder was finally going out of business and our sanctuary agreed to take in and place all the unadoptable and unsocialized cats. When Willow arrived, she weighed only 4.2 lbs. We thought she was a kitten, but her records showed she was 2 years old. 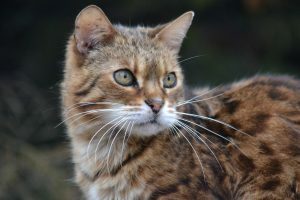 She suffered from inflammatory bowel disease, common in Bengal cats, and soon after arrival needed emergency surgery for a prolapsed colon due to chronic diarrhea. No wonder she was so small. She wasn’t absorbing any of the nutrients she was eating. Over the years, it took a specialized diet, supplements and close monitoring to keep her on the right track. At her largest, she was a little over 6 lbs. It was a never ending balancing act with several setbacks, but many good years too. This little girl had a strong voice and loved to call to the birds. She enjoyed playing in her pool and always joined her friends when treats were handed out. Climbing logs and the cave in her outdoor yard was a favorite pastime. She loved to sleep on cat condos in her bungalow, and often would be found curled with her sister Tahiti – also a very small Bengal with chronic health issues. For being such a small peanut, she made a huge impression on all of us. She will be deeply missed by her human and cat friends. Willow, you now get to join your family on the other side. You were small only in stature. Your sweetness and personality filled the sanctuary. 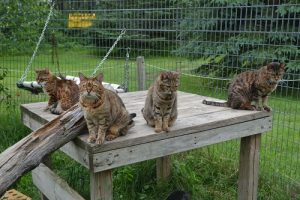 TWS was contacted by a Bengal rescue group in Colorado, where a large breeder was closing down and needed to place the cats that were not adoptable. They had several hybrid F3 Bengals that were unable to be socialized for adoption. They called TWS and we accepted nine of the cats into our hybrid program. She was born in 2004 and came to the sanctuary in 2006 to stay. Willow is by far the smallest cat at the sanctuary. She is very shy, but can be found lying out in the indoor bungalow area on the perches or even perching on top of the fan. She lives with several other cats to keep her company. Willow lives in a bungalow with both an indoor and outdoor area complete with rocks, perches, hammocks, logs, and even an in-ground pool. The indoor area is temperature controlled for the harshest Minnesota winters and the warmest summer days.